Doing laundry by hand; could you do it if the situation called for it? You can do it with a few tools and a little practice – like our great great grandmothers; and it is a good skill to know. Even if you aren’t of the “prepper” mindset, knowing how to do some basic chores off-grid. 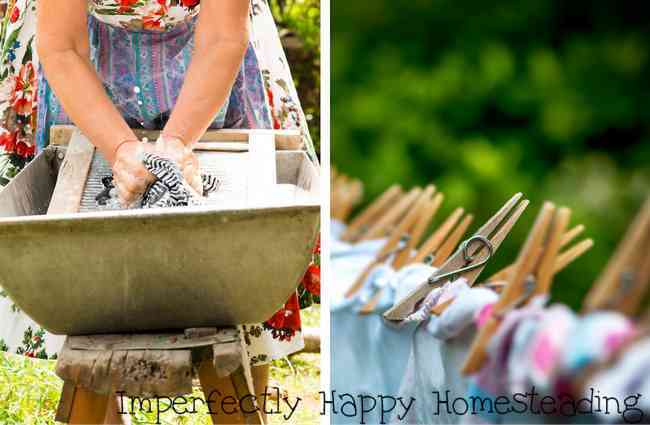 If you’re a homesteader like me, you want to keep vintage skills alive; laundry by hand is certainly a vintage skill that most of us rarely, if ever, use. or even better, use my Laundryonaise recipe! A Wash Board – made for washing, not decorative.
. The metal will last longer but the plastic may be easier on your clothes. Clothing line and/or rack for drying. Spend the money on good pins or you’ll be re-buying these all the time! Separate your colors & whites – yep still a good idea. Presoak – you’ll want to prepare your tub with water and soap shavings and soak your clothes in this for 15 to 20 minutes. If you’re really off-grid and need hot water you’ll need to heat some up before this step. Now take each piece of clothing, rub a little soap on it and then scrub against the washboard, dunk in the water, scrub again. Once all the clothes are done you’ll want a separate tub for rinsing the soap out. It is basically dunking, wring, dunk, wring. (or rapid washer) can also be an excellent tool and save your back a bit. This works like the agitator in your washing machine. Extremely helpful in the rinse stage! So you are ready to do more laundry by hand but not to scrub a board? I have a few non-electric appliances that are portable and easy to use. I hope you will give laundry by hand a try. It is a great vintage / homesteading / prepping skill to have. With a little investment you can have all the tools you’ll need for years to come. This tried and true method can save you money too! A big mistake for many is to use too much soap. Spot treat problem areas, under arms and collars in shirts, knees, seat and leg cuffs in pants. Also a final rinse in clear water with a dash of white vinager, it strips out any left over soap in the fibers or a dash of bleach with whites and white towels. Remember to wear gloves or you will end up with sore red dry hands. And the warmer the water the better the soap will work. Tiffany, I couldn’t resist this post when I saw it on Pinterest! My Southern grandmother taught me how to do laundry by hand with a washboard when I was a little girl. I wanted to wash my clothes, but I wasn’t allowed to use the washer because I was too young. So Grandma got me a chair to stand on by her washtub (does anyone still have those big deep sinks in their laundry room?) and gave me a lesson. We did that several times over the summer between second and third grade, so I remember it well. I still remember some of the garments even! My mother, who was born in 1896 in Scotland,never had a washing machine. She washed all her laundry by hand. She did not use a washboard. Her kitchen had a large deep white tub and she pre-soaked her laundry the night before. She would scrub collars and cuffs with bar soap and a brush. In winter she liked to put table linen out on a frosty night to make them really white. She also used a little block of blue, which came in a little cotton bag, into the final rinse to enhance the whiteness. When I was at school in the 1940’s they taught home economics and one of our lessons was laundry. They used washboards and heavy flat irons which we heated on a coal fired stove. All museum stuff now, thank goodness! My great grandmother did that with me and we still have several of those black flat iron’s sitting next to fireplaces in the family. I remember playing “olden days” with her (I would beg her to do it) and we would cook in the big kettle she had that hung on a hook that swung out and back into the large fireplace in her living room. Thank you for reminding me of that, they are fond memories. I spent 4 weeks without my washing machine last summer, so washed clothes everyday instead of letting them stack up. Sometimes in the bath because that was the only place I could access water. and sometimes in the hand basin. I quite often wash a few things buy hand anyway. Luckily we had some lovely weather to be able to dry the clothes outside because I couldn’t spin them. I always dry my clothes outdoor when the weather is fine. Here in Phoenix, most of the time, my loads will dry faster outside than in a dryer! To help with wringing out the water, get yourself a commercial sized salad spinner. I have one and it works just dandy! That’s brilliant! Thank you for sharing Naomi! I did a lot of laundry by hand after hurricane Maria passed our island, leaving us with no electricity or water. Good thing I knew how to do it, but it was a learning experience to others. It is so good if we can be prepared like you!